Athena is going to be 1 on April 2nd! I can’t believe it! It’s truly amazing how quickly time flies by. It seems like yesterday that I was starting to worry about giving birth and now she’s walking, talking, and eating table foods. I am a mother! How the heck did that even happen? (This is a rhetorical question; please don’t comment.) I feel like a kid myself most times and now I’m completely responsible for a little human being who looks to me for comfort and care. It’s beautiful and scary and intense all at once, but here it is. Thinking about a birthday gift was overwhelming in itself. What do you get for a one year old? What is the best 1st birthday gift? I didn’t want to get her something that she’d like for a few days and then toss aside. I didn’t want to get her clothes or something completely practical; it’s still a birthday after all. 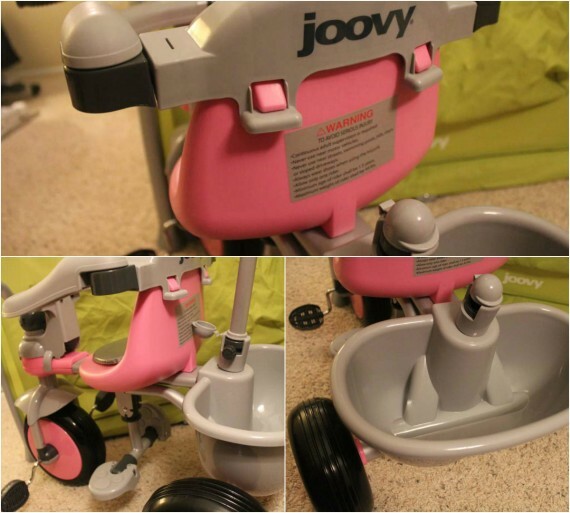 I decided on the Joovy Tricycoo and it totally rocks… or should I say rolls? Regardless, it’s awesome. She can use it now with a little help from us, then on her own with us pushing, and finally like a big girl without our help. It’s a great way to introduce her to balance and coordination and it’s pink! Win, win! I haven’t let Athena use it yet since her birthday is still a month away, but we put it together to check it out for ourselves. Although it comes in many pieces, it’s straight forward and a short task. Besides, Darren and I enjoy working together to make things or put them together. It comes with baby surround arms. These arms are removable and they’ll keep Athena inside the Tricycoo like a high chair. They are simple to lock into place or unlock to get her in and out. She’s big enough to sit in the seat and the arms will provide security and comfort. It also comes with a locking feature on the front wheel. The wheel locking feature will allow me to unlock the front wheel so the pedals spin freely without force or the need to pedal. While I push Athena, the pedals will stay in place so she can rest her feet and not have her legs spinning in circles or her feet hitting against the pedals. 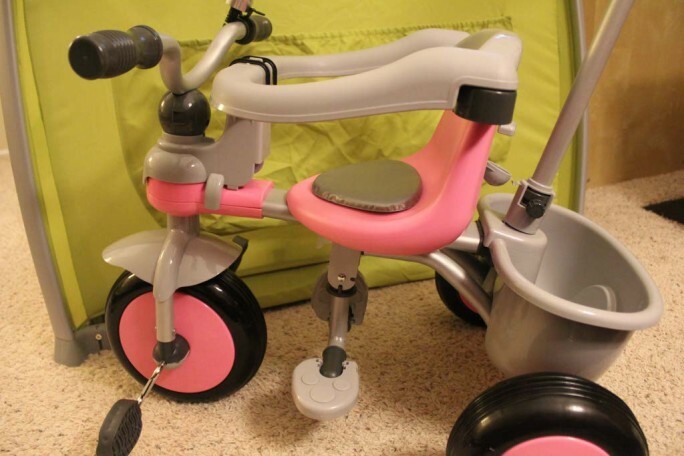 All it takes is one flip of a lever on the front wheel to engage the pedals when needed so it can easily be adjusted to Athena’s comfort level. The best feature for smaller children is the handle for parents. My back is already feeling the strain of bending over all the time, playing on the floor, and carrying Athena. 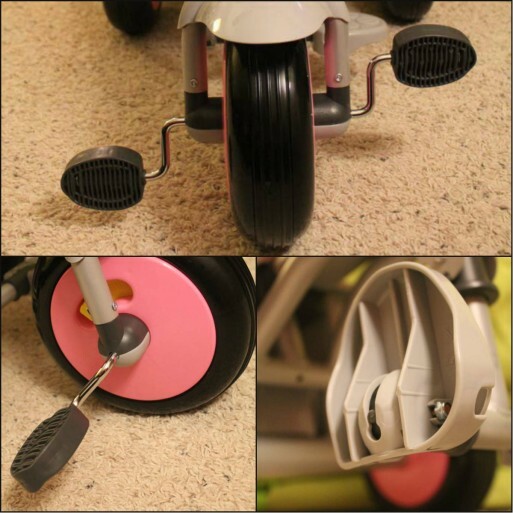 The handle eliminates the need to bend over to push the Tricycoo along. The parent push handle overrides the child’s steering so I can direct her where I want to go. It’s also adjustable with 4 positions from 32.5 to 38 inches high. This is one baby product that doesn’t hurt my back. With injection-molded, urethane treads, the wheels will roll quietly on most floors, which is great for our new hardwood floors. As Athena gets older, the tricycle can be converted to remove the safety features. 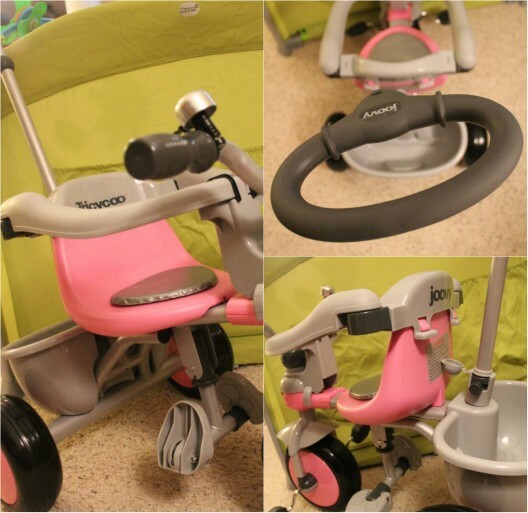 The Tricycoo parent push handle, the footrest, and the baby surround arms can both be removed when no longer needed. 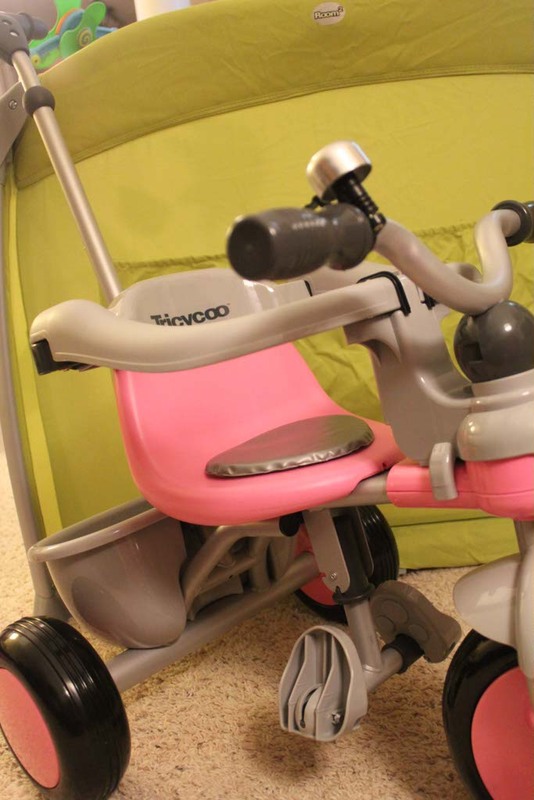 Since the tricycoo is made with a steel frame, it can accommodate Athena up to 44 pounds! Additional “cool” points are given for the cute storage basket that Athena can fill with toys to take to the park and the bell. Every child’s bike needs a bell. Joovy makes the cutest products for children. The Joovy strollers, playards, walkers, and toys are always modern, fun colors and are practical for both parents and child. 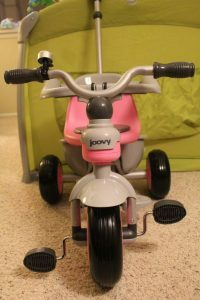 The new Joovy Tricycoo is no exception! With features that grow as Athena grows, we’ll be using the Tricycoo for birthdays to come. Good job! An fearless adventurer for a mom?! We all dream. This will make the perfect gift for my granddaughter’s birthday. I’m going to see if I can buy it at Toys R Us and if not I’ll try to order it online. I like the color and the sturdiness of it. Athena is a lucky girl. I think Athena is going to love it. She has a small sit on toy now and she’s always playing on it. This is perfect for her. I just ordered it for my niece making me the best auntie in the world. I voted for you in the contest too. Good luck. You deserve to win. Thank you for voting in MyBBB. I’m currently in 3rd place so I appreciate all the votes I can get. I’ve been looking for the Pink Tricycoo everywhere! Where did you buy yours from?